This is well documented - 17in Coal Engine LMS No. 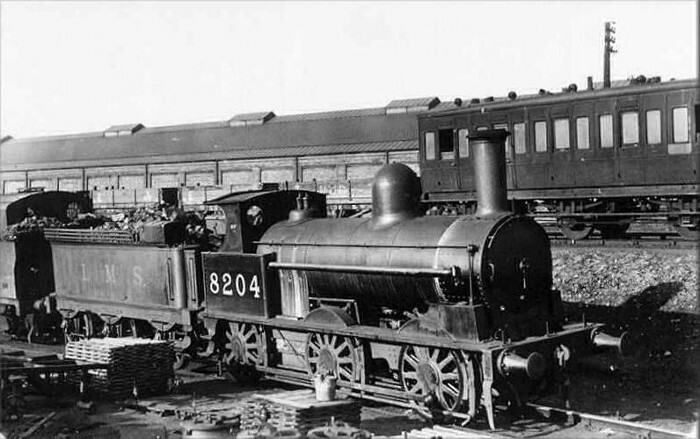 8204 at Crewe South shed on 5th May 1934 with the carriage shed in the background. But what is the carriage on the right? The carriage looks like a standard LNWR 30ft 1in 5 compartment third to D297, described by Philip Millard as the “must numerous of any British railway carriage”. The livery is less clear though. I suppose it could be all-over LMS red, but it looks a bit drab for that. Maybe it is a departmental livery? I think the carriage is painted black and is being used as an Engineering Dept. mess room. If so there should be a large letter E on the bottom corner of the carriage as on the wagons in the background. Maybe it’s on the right hand corner.